TULSA, Okla. -- A black man fatally shot by a white Tulsa, Oklahoma, police officer responding to a stalled vehicle had no weapon on him or in his SUV, the city’s police chief said Monday. An investigation is underway into Friday’s shooting death of 40-year-old Terence Crutcher, Tulsa Police Chief Chuck Jordan said, just before the department released dashcam footage of the shooting. Meanwhile, a federal prosecutor says the U.S. Department of Justice has opened a civil rights investigation into the shooting. Authorities said the shooting occurred after an officer stopped to investigate a vehicle in the middle of a road. Police said Crutcher approached after officers arrived to assist. Police investigators said Crutcher refused several orders to show his hands and when he reached back into his car one officer deployed a Taser while another officer fired one shot, reports CBS affiliate KOTV. 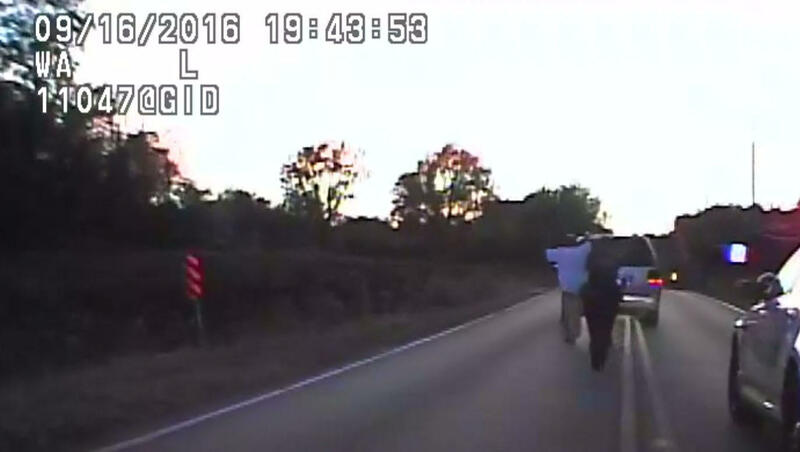 The video shows Crutcher with his hands in the air as officers direct him to walk towards a vehicle, which is stopped in the middle of the road, and place his hands on it. At one point he’s seen lowering one hand and he’s surrounded by police officers, making it harder to see his actions from the police dashboard camera’s angle. Police also released helicopter footage of the incident, but his movements are obscured by the car in that footage. Crutcher can be seen dropping to the ground. Someone on the police radio says, “I think he may have just been Tasered.” One of the officers near Crutcher backs up slightly. Then almost immediately, someone can be heard saying, “Shots fired.” Crutcher’s head then drops, leaving him lying motionless. Damario Solomon-Simmons, an attorney for Crutcher’s family, said when they watched the video, they didn’t see Crutcher reach into the car or attack officers. “We saw that Terence did not have any weapon. Terence did not make any sudden movements. We saw that Terence was not being belligerent,” said. Solomon-Simmons, said at a news conference separate from one police held. Crutcher is seen in the video after he’s shot lying in the street for more than two minutes before officials render aid. “Terrence died on that street by himself, in his own blood, without any help,” Solomon-Simmons said. Solomon-Simmons called the video “extremely disturbing” and said family has no doubt it was an unjustified shooting. Crutcher’s twin sister Tiffany said the shooting was incompetent and negligent, and she wants charges brought against the officer involved, reports CBS affiliate KOTV. Tulsa Police Sgt. Shane Tuell confirmed that relatives were shown the recordings Sunday ahead of the public release. Police say Tulsa officer Betty Shelby fired the fatal shot, while officer Tyler Turnbough used a stun gun on Crutcher. Both officers are white, MacKenzie said Monday. In a statement, the U.S. Attorney for the Northern District of Oklahoma said a Justice Department probe would determine whether a federal civil rights violation occurred after a “comprehensive review” of the shooting. “The Justice Department is committed to investigating allegations of excessive force by law enforcement officers and will devote the resources necessary to ensure that all allegations of serious civil rights violations are fully and complete investigated,” the statement read.